CAT 2016 is around 1 month away. You might be a student who is confident because you have finished the syllabus. You might be a student who is worried because you have not given enough number of mocks. You might be a student who has lost hope and is mentally prepared to take the exam again next year. Whatever the case may be, it is perfectly natural to be confused at this stage of CAT preparation. As a matter of fact, I would be really surprised if you are a serious CAT aspirant and not confused at this stage. In this post, I will try to spout some ‘gyaan’. I know that I would be stating the obvious but even if there is one student who is benefited by it, I think it is worth the effort for me. For you, a serious CAT aspirant, you might learn something new. If not, think of it as training for reading a boring passage in the Reading Comprehension section of CAT 2016. While a large number of candidates who will be trying their hand at CAT 2016 would be students and comfortable with exams because they write exams every semester; there will be a large chunk of candidates who would have written an exam years ago. If you are in that category, it is imperative that you start studying in 3-hour sessions. It is not easy to sit and concentrate for 3 hours. You need to train your body and your mind for the same. While you might be studying for 4 hours everyday or even 10-hours everyday, if you are not putting in enough 3-hour sessions – you might be in for a nasty surprise during the exam. You might spend few crucial minutes fantasizing about superpowers of stopping time, which might prove costly during the exam. OK – I understand if that previous example has happened only with me but trust me on this, if you do not train your body and mind for a rigorous 3-hour session, your score will suffer. Quite a few students become obsessed with preparation. This happens more with students who take a 1-month / 2-week leave from their office for preparation. I have seen students feel guilty and suffer from it if they are not studying continuously in this so called ‘study break’. It is important to use your time wisely but it is equally necessary not to over burden yourself. If you enjoy some sports, nothing like it. That’s probably the best kind of break you can have. A movie outing might not be such a bad idea either. Having said that, I would not put spending time on ‘social media’ under the category of a break. The breaks that you need to take should be physical in nature. If you are in any place other than Delhi, taking a walk outside once a day might be a good idea. If you are in Delhi, well – go ahead and have another cigarette. You have already had 14 for the day. As clichéd as it might sound, nothing can kill productivity faster than Chikungunya. While you might not be the fittest person in the room, just try avoiding butter chicken and dal makhni for a month. You are not running a marathon but eating healthy and sleeping right can have a significant impact on your productivity. If you are at home to study, there is no point in wasting time feeling lazy all day. God forbid, if you get sick, you will lose couple of important days. Getting sick might not make a significant dent to your preparation but there is no harm in being extra cautious for this one month period. This is an obvious trick that a lot of students miss out on. If you have an exam from 10 AM to 1 PM, it is important that you take at least 2 or 3 mocks in that time slot before the actual exam. Try to follow the same routine that you plan to execute on the day of the exam. For example, sleep at the time you would go to sleep the previous night. Wake up at the scheduled time. Basically, take the mock as you would take the actual exam. Some of us our night-owls. Some of us study the best at 6 AM. But you need to be at your best during the exam slot. This exercise will help you train your body to deliver peak performance in the correct time-slot. It is of utmost importance that you shut out all the negative thoughts during this last one month. It is ok if you have 63% in graduation. You cannot change that. Stop thinking about stuff like that. Do keep in mind that if you end up with a score of 98+, you will get a call from some of the best business schools in India. Being in the top 2%ile of anything in India is a big deal. It should make you proud. It would be a good idea to think about that instead of your past academic record. Or Installments. Or Parajumbles. Or Circular Arrangement. Basically, the point that I am trying to make is – do not leave any topic. You still have more than enough time to prepare any topic. A mental block towards any topic is going to do you a lot of harm. Even if the probability of a question on probability being asked in the CAT 2016 exam is low, the probability of the mental block against probability hampering your performance is high. While there is an obvious benefit of finishing the syllabus and being comfortable with all topics with respect to it increasing the chances of a CAT aspirant getting a good score, the confidence of finishing the syllabus offers you an advantage that is hard to quantify or express. If you think attempting Quant in two rounds is a good idea – try it in a few mocks before the actual exam. If you think it is a good idea to attempt all Reading Comprehension passages before the Parajumbles or Critical Reasoning questions, you should experiment with that before the actual exam. Do not leave it for the last minute. Try out all the necessary experiments so that you enter the exam with a clear strategy with which you will attempt the CAT 2016 exam. This is probably the most effective thing that you can do in the last month for maximum impact on results. While there is no right or wrong schedule for the last month, I would strongly recommend that you touch upon every topic during this period. A good way to do this is attempting mocks and analyzing them but you should also give sufficient time to revising the basic concepts of all the topics involved. Here is what I suggest. Attempt 2 Logical Reasoning sets daily. Attempt 2 Data Interpretation sets daily. Attempt 2 Reading Comprehension passages daily. Attempt 10-15 questions on Parajumbles / Critical Reasoning / Verbal Ability every alternate day. Attempt 10-15 questions on Geometry / Algebra / Arithmetic every alternate day. Attempt 10-15 questions on Number System / Modern Math every alternate day. You should take at least 3 mocks in the last one month if you are consistently scoring below 90%ile. You should spend the rest of time building your basics. You should take at least 5 mocks in the last one month if you are consistently scoring between 90-95%ile. You should spend the rest of the time working on the areas that scare you / the areas you do not feel very confident in. You should take at least 10 mocks in the last month if you consistently scoring above 95%ile. You should focus on tweaking your test taking strategy to maximize your score. 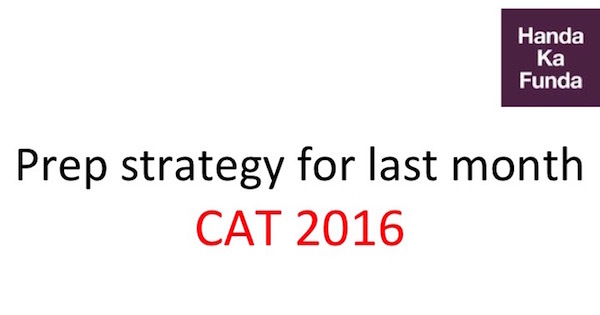 I hope that this post will help you in with your CAT 2016 preparation in the last month. If you found this post helpful, please share it on Facebook / Whatsapp. If you have any questions about your CAT preparation, feel free to email me on [email protected] or call me on 09765142632. I look forward to it. You have a great sense of humour. That cigarette piece got me LOL literally.